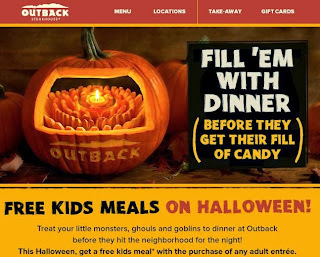 Outback Steakhouse is offering up FREE Kids Meals on Halloween with any adult entree purchase! You do not need a coupon for this freebie. *FREE KIDS MEAL OFFER. VALID WITH THE PURCHASE OF AN ADULT ENTRÉE ON HALLOWEEN, THURSDAY, OCTOBER 31, 2013 ONLY. Valid for lunch or dinner, dine-in or Curbside Take-Away® at participating Outback Steakhouse® locations. No coupon necessary. 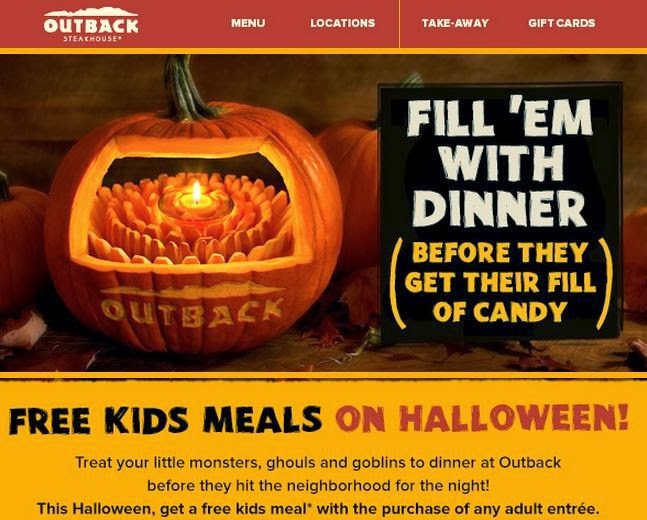 Say “Free Kids Meal” to your server to receive the Offer. One Free Kids Meal with each purchase of an adult entrée (limit 2 free Kids Meals per visit). Offer valid for kids ages 10 years and under. Free Kids Meal choices are from the Joey Menu only and include an entrée and choice of drink. Offer is not valid in conjunction with any other discount, coupon or offer and has no cash value. Offer valid while supplies last. Prices and participation may vary by location. Void where prohibited by law.